Alexander Carpenter (1546/1551 – 1612) was Alex’s 11th Great Grandfather; two of 4,096 in this generation of the Miller line, once through his daughter Juliana and again through his daughter Priscilla Two of his grandchildren [first cousins] Lt. Ephraim MORTON and Ann COOPER married in 18 Nov 1644 in Plymouth. Alexander Carpenter was born in 1546 in Wrington, Somerset, England. His parents were William CARPENTER and Abigail [Bluther?]. He married Priscilla DILLEN 1583 in St James, Bath, Somerset, England. Alexander died in 1612 in Wrington, Somerset, England or Leyden, Holland, The Netherlands. Priscilla Dillen was born 1562 or 1568 in Wrington or Bath, Somerset, England. Priscilla died before 1646 in Wrington, Somerset, England. In a letter of 19 Aug 1644 to Mary Carpenter of Wrington, sister of his wife Alice (Carpenter) (Southworth) Bradford, Priscilla’s son-in-law Gov. William Bradford noted that the mother of the Carpenter sisters had recently died, and invited Mary to join them in Plymouth, which she soon did. 1. John CARPENTER, Member of the English Parliament, 1323. 3. John CARPENTER, brother of the town clerk of London. 8. William CARPENTER and Abigail [__?__]. .
Alexander Carpenter was a well-to-do landowner of Wrington, near Bath, in Somerset, England when he became a member of a group of separatists who wished to separate from the Anglican Church and worship according to the dictates of their consciences. With other English refugees the Carpenters fled in 1608 and settled in the area of Leyden, Holland near Saint Peter’s Church. Alexander Carpenter from Wrington was on 16 Dec 1600 [NS] witness at the Amsterdam marriage of “Antoine Fetcher” and “Jenneken Richeman” [J. de Hoop Scheffer, History of the Free Churchmen …. Alexander Carpenter was a member of the “Ancient Brethren” The first English Separatist church in The Netherlands had been formed in Amsterdam in the 1590s; it was known as the “Ancient Brethren.” This church was regularly joined by other English dissidents and, the famous founders of the future of Plymouth Colony from Scrooby, England did not arrive until 1608. Shortly after the Pilgrims arrived, controversies split the Amsterdam congregation. John Smyth re-baptized himself and then all others who wanted to form a distinct Separatist congregation in Amsterdam with him. Out of this group Rev.Thomas Helwys eventually returned to England to found the first English Baptist Church. The remnant sought contact with Dutch Mennonites. During this split in the Ancient Brethren, John Robinson and William BREWSTER led the Pilgrims (about a third of the Amsterdam Separatists) to Leiden, a move which their pastor from Scrooby, Clyfton, did not make with them. Robinson thus became the pastor of the Pilgrims. The move to Leiden was carefully prepared. Robinson and about one hundred other Pilgrims requested permission to reside in Leiden,in a document dated February 12, 1609. The city’s permission included the following statement, now famous, that Leiden “refuses no honest people free entry to come live in the city, as long as they behave honestly and obey all the laws and ordinances, and under those conditions the applicants’ arrival here would be pleasing and welcome.” The Carpenters must have gone with the new group because by 1611 Alexander was at Leiden. Alexander Carpenter was the father of at least five daughters, four of whom came to Plymouth Colony early in its history. The gap between the two historical record (the Saint James parish of Bath and the Wrington Church records (1550–1612) allows the possibility of other children. Others say the years of birth of the sisters are best approximated based on the ages at death of Julianna, Mary and Priscilla, and then made consistent with one another. Some of these women, however, seem to be a few years older than the norm at their first marriages, and extreme ages at death are frequently exaggerated, so it may be that all these estimated birth dates should be shifted forward by a few years. In 1988 Janet K. Pease published some entries from the IGI which purport to relate to this family, but many of them were clearly not from the parish registers. A year later Myrtle Hyde published the results of research that had been carried out in 1971 in the registers of St. James, Bath, and Wrington, Somersetshire; these entries seem more reliable, but some discrepancies remain. It is believed that he died by 1610 in Leyden, Zuid Holland, Netherlands. No marriage has been found. Agnes’ husband Samuel Fuller (wiki) was born 20 Jan 1580 in Redenhall, Norfolk, England. His parents were Robert Fuller and Sarah Dunkhorne. Samuel’s father Robert was a butcher. Initially Samuel learned the trade of a say-weaver, one who makes cloth for tablecloths and bedding. 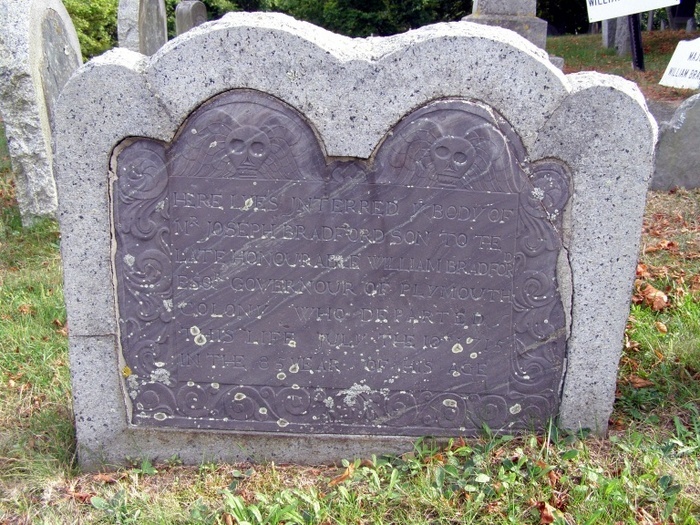 Samuel died in 1633 in Plymouth, Plymouth, Mass. In 1604 the Puritan minister John Robinson left his position at Cambridge to become pastor of St. Andrew’s Church in Norwich. In the face of persecution from King James I, Robinson left Norwich and soon made his way to the village of Scrooby. Samuel Fuller went to Scrooby as well at this time, presumably influenced by Robinson. In 1609 the Separatist congregation at Scrooby escaped to the Netherlands and made their way to the city of Leiden, where they could worship as they pleased. Fuller went with them to Leiden and became a deacon in their congregation. Agnes Carpenter married 24 April 1613 in Leyden, Samuel Fuller, as his second wife. 1613 : “Fuller, Samuel of London, widr. of Els Glaescoock (Alice Glasscock) acc. by Alexander Carpenter, William Hoyt (William White) his brother-in- law, Rogier Wiltsum (Roger Wilson) and Eduart Saetwood (Edward Southworth) his acq. betr. 15 March 1613, mar. 24 April 1613 to Agnys Carpenter of Wrenten in England, acc. by Agnys Weijt and Els Carpenter her sister. 1613 : “Sodtwaert, Eduwaert (Edward Southworth) of England, Say-worker, acc. by Tomas Sodwaert (Thomas Southworth) his brother, Samuel Fuller his brother-in-law and Rogier Wilsom betr. 4 May 1613, mar. 27 May 1613 to Els Carpenter of England, acc. by Anna Ras and Elysabeth Gennings her acq. He had previously 24 Apr 1613 in Leiden, Zuid Holland, Netherlands to Alice Glascock (1580 in Redenhall, Norfolk, England – 1613). Dr. Fuller was then a silk weaver in Leyden and a leader of the separatist group known as the Ancient Brethren. Agnes gave birth to a child but it died in infancy and was buried in Leiden. Agnes died within four years of her marriage and was buried in Saint Peter’s Church of Leyden. 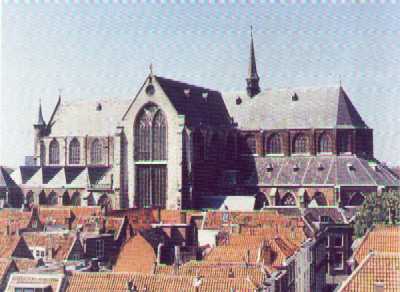 The Pieterskerk is a late-Gothic church in Leiden dedicated to Saint Peter. It is best known today as the church of the Pilgrim Fathers where John Robinson was buried. Samuel Fuller’s third marriage, to Bridget Lee, (1600 in Leiden, S Holland – 1 Mar 1664 in Plymouth, Plymouth, Mass.) is recorded in Amsterdam, Holland 27 May 1617. When the Mayflower sailed in 1620 Dr. Fuller was its chief physician and surgeon. Samuel Fuller came on the Mayflower in 1620, leaving behind his wife Bridget. She would come later, on the ship Anne in 1623. Samuel Fuller’s brother Edward Fuller, along with Edward’s wife Ann joined him on the Mayflower. He was the Colony’s doctor, and was a church deacon. His wife Bridget may have been the church’s deaconess. Samuel Fuller spent time helping the sick at Neumkeag (now Salem), in 1629. He himself became sick in the autumn of 1633, and died, as did a number of other Plymouth residents. Julian CARPENTER MORTON and Alice Carpenter Southworth and their families apparently in late 1619 or early 1620 had residence at the Heneage House (the former home of Thomas Heneage), on Duke’s Place (a street), in Aldgate, an area of London known to be home to hundreds of Dutchmen as well as a large number of religious dissenters. That is where Edward Southworth died by 1622. 1600 print of Aldgate. 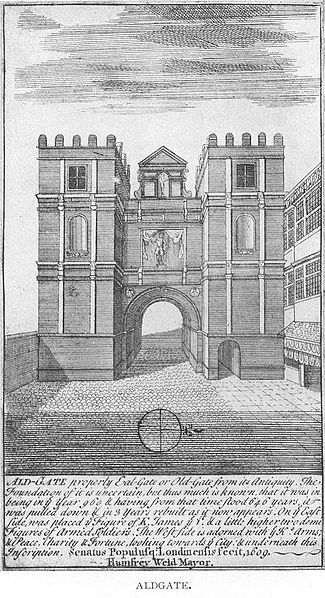 Aldgate was the eastern most gateway through London Wall leading from the City of London to Whitechapel and the east end of London. When Bradford was 12 years old, a young friend invited him to hear the Rev. Richard Clyfton preach 10 miles away in Babworth. Clyfton was a Puritan minister who believed that the Church of England required strict reforms to eliminate all vestiges of Catholic practices. This would, proponents believed, result in a more “pure” Christian church. Bradford was immediately inspired by Clyfton’s preachings. King James I took the English throne in 1603 and declared that he would put an end to church reform and deal harshly with radical critics of the Church of England. By 1607, a group of about 50 reform-minded individuals began meeting secretly at Scrooby Manor to celebrate the Sabbath, led by Richard Clyfton and also Rev. John Robinson. This group soon decided that reform of the Church of England was hopeless and that they would separate all ties with it. Thus they became known as Separatists. The weekly meetings of the Separatists soon attracted the attention of the Archbishop of York and many members of the congregation were arrested in 1607. Brewster was found guilty of being “disobedient in matters of religion” and fined. Some members were imprisoned and others were watched, according to Bradford, “night and day” by those loyal to the archbishop. Adding to their concerns, members of the Scrooby congregation learned that other Separatists in London had been imprisoned and left to starve. When the Scrooby congregation decided in 1607 to leave England illegally for the Dutch Republic (where religious freedom was permitted), William Bradford determined to go with them. The group encountered several major setbacks in trying to leave England, most notably their betrayal by an English sea captain who had agreed to bring the congregation to the Netherlands but instead turned them over to authorities. Most of the congregation, including Bradford, were imprisoned for a short time after this failed attempt. By the summer of 1608, however, the Scrooby congregation, including 18-year-old William Bradford, had managed to escape England in small groups and relocated in Amsterdam. William Bradford arrived in Amsterdam in August 1608. Having no family with him, Bradford was taken in by the Brewster household. The Separatists, being foreigners and having spent most of their money in attempts to get to the Dutch Republic, had to work the lowest of jobs and lived in poor conditions. After nine months, the congregation chose to relocate to the smaller city of Leiden. Bradford continued to reside with the BREWSTER family in a poor Leiden neighborhood known as Stink Alley Conditions changed dramatically for Bradford, however, when he turned 21 and was able to claim his family inheritance in 1611. Bradford soon bought his own house, set up a workshop as a fustian weaver, and earned a reputable standing. In 1613, Bradford married Dorothy May, the daughter of a well-off English couple living in Amsterdam. The couple was married in a civil service, as the Separatists could find no example of a religious service in the Scriptures. In 1617, the Bradfords had their first child, John Bradford. The Mayflower’s departure was emotional. Many families were split as some Separatists stayed behind in the Netherlands, planning to make the voyage to the New World after the colony had been established. William and Dorothy Bradford left their three year old son John with Dorothy’s parents in Amsterdam, possibly because he was too frail to make the voyage. During the third exploration from the Mayflower, which departed on December 6, 1620, a group of men including Bradford located present day Plymouth Bay, explored the bay and found a suitable place for settlement, now the site of downtown Plymouth, Massachusetts. The exploring party made their way back to the Mayflower to share the good news that a place for settlement had been found. When Bradford arrived back onboard, he learned of the death of his wife, Dorothy. The day after he had embarked with the exploring party, Dorothy slipped over the side of the Mayflower and drowned. The the 1952 film Plymouth Adventure tells a fictionalized version of the Pilgrims’ voyage across the Atlantic Ocean to America aboard the Mayflower. During the long sea voyage, Capt. Christopher Jones (Spencer Tracy) falls in love with Dorothy Bradford (Gene Tierney), the wife of William Bradford (Leo Genn). The love triangle is resolved by Dorothy’s tragic slip overboard at the film’s conclusion. Many historians, including Nathaniel Philbrick and Gary Schmidt, suggest that Dorothy may have committed suicide due to despair over her separation from her only son John and fear of settling in a dangerous wilderness. Bradford did not write about her death in his journal, and there are no evidence that Bradford ever spoke of her again. Some, including historian Kieran Doherty, suggest that Bradford’s silence on the subject is an indication of his purported shame over her suicide. There are no contemporary accounts to indicate whether her death was an accident or a suicide. In 1627 John Bradford Jr. came to Plymouth and found his father’s household full. In 1640 Plymouth, Mass, he maried Martha Bourne, daughter of our ancestor Thomas BOURNE He moved to Duxbury sometime before 1645. He finally settled among the earliest proprietors of Norwich CT in about 1652 and served as Lt. Deputy to the General Court in Norwich CT in that year. John and Martha had no children. He gave house and home lot to nephew, Thomas. John died 1678 in Norwich, New London, CT.
Alice Carpenter was courted by many suitors, among them young William Bradford. This marriage was opposed by her parents, who favored Edward Southworth, one of the seven sons of Sir Thomas Southworth. Obeying their wishes, Alice married Edward Southworth. Following the birth of two sons, Edward died in London, and in 1623 Alice accompanied her brother-in-law and sister to new England aboard the ship Ann. A month later she married Governor Bradford, whose young wife Dorothy May Bradford had died in a drowning accident upon the Mayflower’s arrival at Plymouth. As first lady she was loved and regarded highly for her strength of character and her willingness to help those in need. She had a good education for her times, and brought considerable property with her from England. She provided guidance to the youth of the colony and promoted an interest in the literature. She lectured on current topics with grace and charm. The Bradfords enjoyed a happy marriage lasting 34 years. The Bradford household contained, at least seven and probably ten orphans including several of our ancestors. Of the eighteen members of his family only one-third of them bore the name of Bradford. In the 1627 Cattle Division Mr. William Bradford had with him, “to wit: his wife Alice Bradford, William Bradford, Mercy Bradford, Joseph Rogers, Thomas CUSHMAN, William Latham, Mannassah Kempton, his wife Juliana Carpenter MORTON KEMPTON who was previously married to George MORTON, and her children Nathaniel Morton, John Morton, Lt. Ephraim MORTON, and Patience Morton. A descendant of Alice and her first husband Edward Southworth was President Franklin Delano Roosevelt. Alice Carpenter Southworth Bradford’s death eulogy was probably typical of all the Carpenter sisters. i. Constant Southworth b. ca. 1612 (based on date of marriage); d. Duxbury MA, 11 March 1678/79; m. in Plymouth, 2 Nov 1637 to Elizabeth Collier, daughter of our ancestors William COLLIER and Jane CLARKE. Elizabeth died after 20 Feb 1678/79 (date of husband’s will). Their 8 Children: Mercy Freeman, Priscilla Talbott Irish, Edward, Alice Church, Nathaniel, Mary Alden, William, & Elizabrth Gallup. Constant, born in Leyden and was about fourteen years old when he came over in 1628 with his brother Thomas. Settled at Duxbury, was a volunteer in Pequod war, 1637. Had five daughters and three son. He was for seventeen years deputy from Duxbury and for sixteen years was the Colony’s treasurer. Was commissary in King Philip’s war although then sixty-one year old. ii. Thomas Southworth b. ca. 1617 (based on age at death), He came to Plymouth Colony in 1628 with his brother, Constant. d. Plymouth, 8 Dec 1669, in his 53rd year; m. Elizabeth Reynor at Plymouth, 1 Sep 1641. She died after 3 June 1679, Their only known child: Elizabeth (Southworth) Howland. Captain Thomas Southworth, though only twenty-eight when elder Brewster died was proposed as his successor ; but Bradford, who had designed him for the civil service, caused the substitution of another of his proteges, Thomas CUSHMAN. He was deputy from Plymouth 1651, the next year became an assistant and continued so for eighteen years; was also deputy from Plymouth and at the same time an assistant for the county at large. He was also a prominent military man. In 1654, John Faunce, the husband of Thomas’ cousin Patience Morton died. . At the head of the grave, during the burial, stood a pitiful group of little orphans left in poverty, but Lieutenant Southworth taking by the hand Thomas, a boy of eight years, led him away to adopt into his o family and, transmitting that which he had received from Gov. 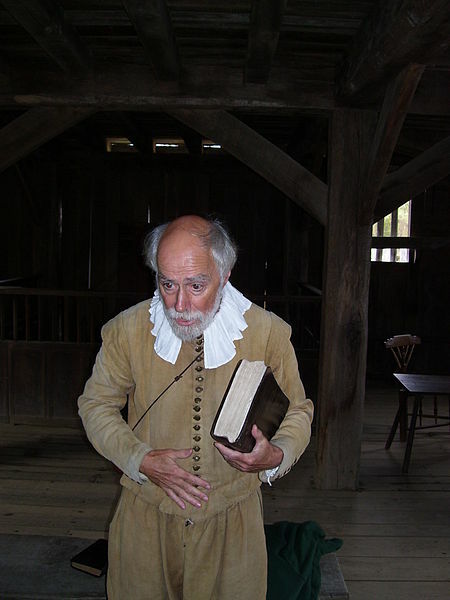 Bradford, gave the orphan a good education, secular and religious, for which Thomas Faunce, the last ruling elder known in Plymouth, said that he had “reason to bless God to all eternity.” Thomas Faunce was the last Piligrim Elder. In his old age is responsible for the story of Plymouth Rock. When plans were afoot to build a wharf at the Pilgrim’s landing site in 1741, 121 years after the Pilgrims landed, a 94-year-old Elder of the church named Thomas Faunce (who was the town record keeper for most of his adult life) identified the precise rock his father had told him was the first solid land the Pilgrims set foot upon. iii. Maj. William Bradford b. 17 June 1624 in the Plymouth. ; m. Alice Richards, daughter of Thomas Richards and Welthian Loring, on 23 April 1650 in Plymouth; m2. 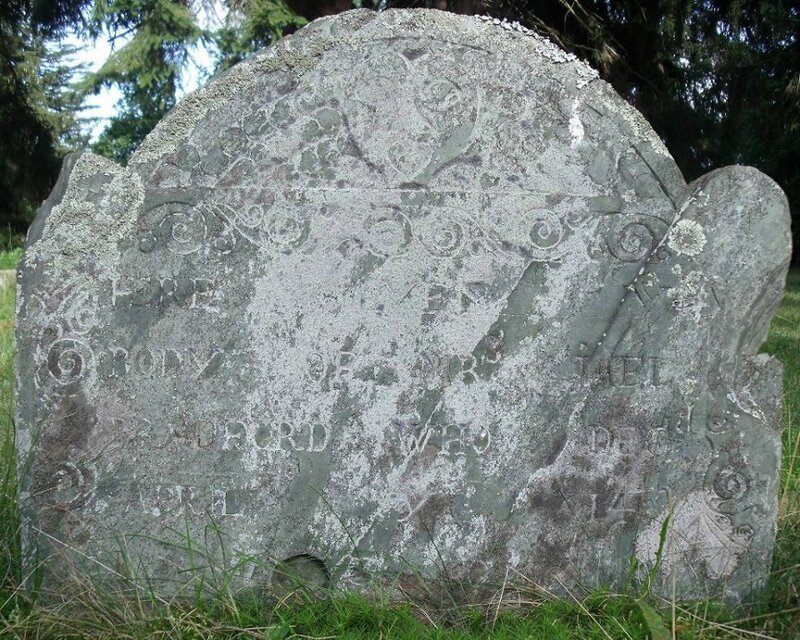 Mary [__?__ widow of Parson Wiswall of Duxbury, Mass. after 1670/71 in Plymouth one theory is that she was actually the widow of Francis Griswold; m3. Mary Atwood, widow of John Holmes, pastor of Duxbury and a daughter of John Wood, alias Atwood, of Plymouth., circa 1676 in Duxbury, the Plymouth; His marriage to Mary Atwood ended in divorce; d. 20 Feb 1703/04 in Plymouth. William’s will was probated on 10 Mar 1703/04, Plymouth. Major William served the colony as a close assistant to the Governor. Altogether (according to his will) he had at least 15 children, and the Mayflower Descendant reports that Alice Richards bore him ten. His sons are listed as John (firstborn), David, Ephraim, Hezekiah, William, Thomas, Samuel, Joseph and Israel. His daughters were Mercy (Steel), Hannah (Ripley), Melatia (Steel), Mary (Hunt), Alce (Fitch) and Sarah (Baker). Next to Miles Standish, he was the chief military man in the colony. In 1662, when Wamsutta, also known as Alexander Pokanoket, the successor of Massasoit was suspected of designs against the English, Major Bradford was with Major Winslow when the sachem was surprised and taken prisoner. He was released by the magistrates to go home but was taken sick and tarried for a while at Major Bradford’s house from whence he was carried on the shoulders of his men and died a few days later. The cause of death was disputed, and Wamsutta’s brother Metacomet (who succeeded Wamsutta in leadership of the Wampanoag) suspected that he had been poisoned. Wamsutta’s death was one of the factors that would eventually lead to the 1675 King Philip’s War. 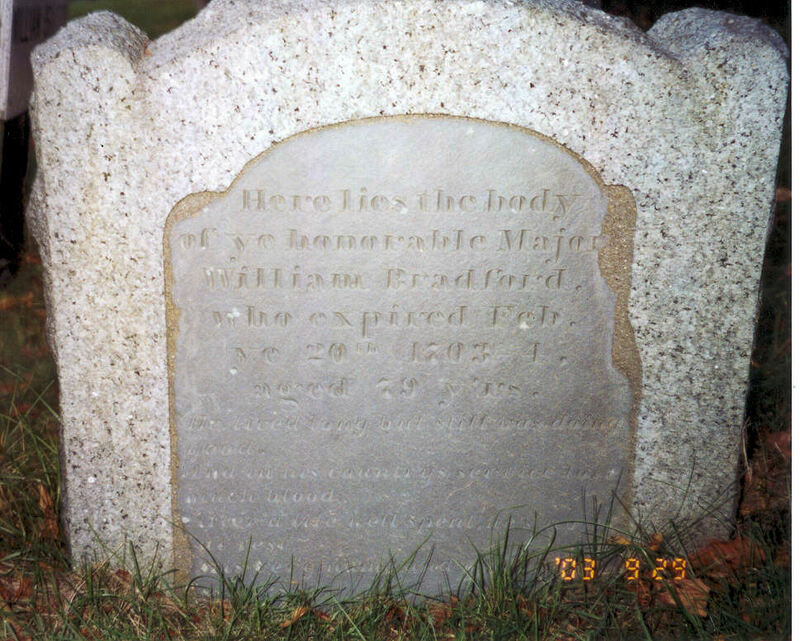 Major in King Philip War Major William Bradford led the Plymouth Regiment in the Great Swamp Fight and was pierced with a musket ball that he carried through life and which found a lodgment with his corpse in the grave. It is also said he had a severe wound in the eye. In 1682 – 1686 William was Deputy Governor of Plymouth. In 1687 he was one of Governor Andros council. Between 1689 – 1691 he was again Deputy Governor of Plymouth. In 1692 he was Councilor of the Province of Massachusetts Bay Charter. Benjamin’s name may be found among those who took the freeman’s oath at Boston May 18, 1642. He afterwards lived at Plymouth on what was called North street but attained no prominence. v. Joseph Bradford b. 1630 Plymouth; d. 10 Jul 1715, Kingston, Plymouth County, Mass. ; m. Jael Hobart b. 28 Dec 1643 Hingham, Plymouth, Mass. ; d. 14 Apr 1730 Kingston, Plymouth, Massachusetts. Jael’s parents were Rev. Peter Hobart (1604 – 1679) and Elizabeth Ibrook (1608 – 1645) Peter was first minister of the Hingham congregation who built Old Ship Church. Hobart, who had attended the heavily Puritan Cambridge University. Natives of Hingham in Norfolk County, East Anglia, Peter Hobart, his father Edmund and his twin brother Capt. Joshua Hobart were among Hingham’s most prominent early settlers. Jael Hobart Bradford Headstone Ancient Burial Ground, Kingston, Plymouth, Mass. Mary never married, lived to be 90 years old, and died in Mar 19-20, 1667, in the home of Gov. William Bradford of Plymouth. Two other children are often attached to this family, most probably in error. The first is Bridget Carpenter on Wrington who some claim married a Samuel Fuller then a Thomas Vincent. She is often confused with “Bridget White Lee” who as a widow married Samuel Fuller, as his third wife, in Leiden on May 27, 1617 and sailed on the Mayflower with her husband. This Bridget was the younger sister (not the daughter born 1608) of Catherine White who married John Robinson. 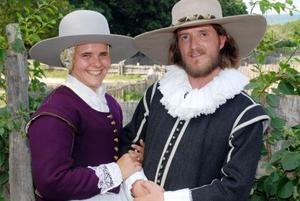 The third “Mrs Fuller” (Bridget White Lee Fuller) arrived on the “Ann” in July of 1623. No other Bridget’s are listed. That ship contained Julian Carpenter Morton and her husband George Morton along with Alice Carpenter Southworth did not have Alice’s two sons. They came later. This entry was posted in 13th Generation, Artistic Representation, Double Ancestors, First Comer, Line - Miller, Storied, Wikipedia Famous and tagged First Thanksgiving, The Anne - 1623, The Struggling Saints 1647. Bookmark the permalink. 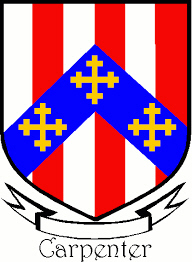 Coat of Arms changed. I use this as a symbol to indicate first of his name in America in this line.